We’re halfway through December and deep into the holiday season. At this time of year, people tend to focus on how much stuff they can buy. Sustainability doesn’t have to take a back seat though. Check out this post on rethinking the holidays or this fact sheet for more info on how to have a more sustainable holiday season. Reduce — Buy only what you need. When you do need to purchase something, look for recycled content or buy used. Buy local food — When possible, support local farmers and reduce your carbon footprint by buying local food. Send E-cards — Communicating the holiday spirit should not be at the price of trees. Instead, consider sending e-cards, which are readily available on the web. If you receive greeting cards, repurpose them as gift tags on your holiday packages. 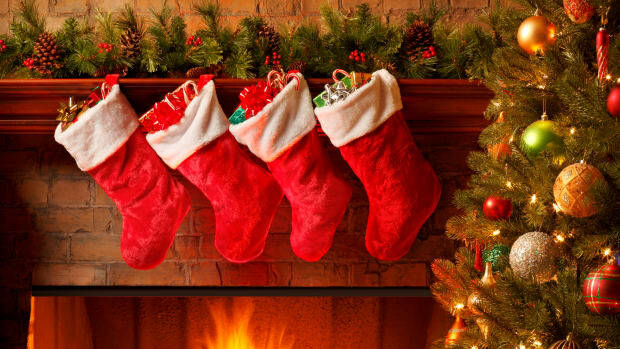 Eco-Friendly gift wrapping — Consider wrapping gifts in recycled material like a newspaper or using something that can be reused, like thin cloth. You can also reuse gift bags that you’ve received from others. This post was written by Joy Scrogum and originally published on the Great Lakes Regional Pollution Prevention Roundtable (GLRPPR) Blog. For more information on Pollution Prevention (P2) Week, see https://www.epa.gov/p2week. 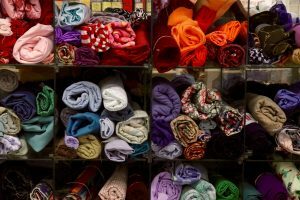 Those of us in the Great Lakes region (and the rest of the US and Canada) live in a so-called “throw-away society” in which consumerism is rampant, and goods are not often designed or produced with durability in mind. In fact, in recent years, more and more goods are designed to be explicitly or implicitly disposable. Even complex products, such as consumer electronics, are treated as if they are meant to be ephemeral. The classic example is the smartphone. These devices are astounding feats of scientific innovation and engineering. For perspective, consider ZME Science’s article from September 2017: Your smartphone is millions of times more powerful than all of NASA’s combined computing in 1969. Despite their complexity, and the fact that you, and probably everyone you know, barely scratch the surface in terms of using these devices to their full potential, we are constantly bombarded with cues to upgrade to the latest model. And new models seem to be released ever more frequently, always being touted as somehow greatly more advanced than their predecessors. A simpler example is clothing–when was the last time you sewed up or patched a hole in a shirt or pair of pants? Something that once would have been done by most people as a matter of course might now be deemed peculiar. A modern member of our culture might wonder why one would bother to patch a pair of pants when a new pair could be obtained so cheaply. 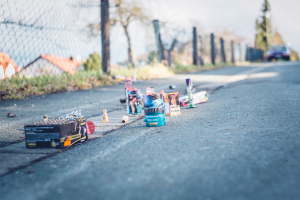 Our “take-make-dispose” model can also be called a linear economy, and the message you receive in such a system is clear: if you have something that becomes damaged or has minor performance issues, you should just replace it. In fact, even if what you have is working well, the time will quickly come when you should just replace the old with the new. Replace, rinse, and repeat. A linear economy is one in which natural resources are extracted and used to create goods which will entirely, or partially, inevitably end up in landfills or incinerators. Some materials may be recovered and recycled, but over time these materials degrade in quality and are used for increasingly lower grade purposes, so that ultimately they will become waste, of little or no further use. Of course, in order to replace whatever is being disposed of, new goods are required. And those new goods require as much or more resources as the ones that went before them–new minerals and other raw materials must be extracted. Extraction processes can have negative environmental and social impacts (e.g. pollution, habitat destruction, human rights issues related to labor practices, health issues related to exposure to chemicals or physical risks, etc.). Materials are transported to factories (requiring the use of energy in the form of fuel) where they are transformed into new products, again potentially with new human exposures to toxins or other adverse conditions, and potential new emissions of toxins or other substances of concern. In the case of products such as electronics, sometimes components are manufactured in places distant from each other and must be further transported to be brought together in yet another factory to create a complete device. And the finished product is in turn transported across the globe to reach consumers, resulting in more expenditure of energy, more emissions. By the time most products reach the consumer, a great deal of natural and human resources have been invested in them, and however positively the product itself may impact a human life or the broader ecosystem, the number of potential negative impacts all along the supply chain have stacked up. Clearly, any tendency to treat products as disposable, purposefully or incidentally, exacerbates those negative impacts by requiring the manufacture of more products, more quickly than might otherwise have been the case, as long as the demand for product does not diminish. The tragedy of this linear cycle of use and disposal has lead to the advocacy for a circular economy–one in which extraction of resources is minimized and products and services are designed in such a way as to maximize the flow of materials through resource loops as close to perpetually as physically possible. In such a system, what might have once been considered “waste” continues to be valued in some form or another. A circular economy is built upon design for durability, reuse, and the ability to keep products in service for as long as possible, followed by the ability to effectively reclaim, reuse and recycle materials. A comparison of linear and circular economies. From the New Zealand Ministry for Environment, https://www.mfe.govt.nz/waste/circular-economy. So while the industrial designers of tomorrow will hopefully create products that are in line with the more circular worldview, what can you as a consumer do today to foster a circular economy? Of course you can reduce your use of materials, but practically, you will still need to use some products in order to support yourself, your family, and your lifestyle. You can reuse materials for something other than their original purpose, and sell or donate unwanted functional items so that someone else may use them. Similarly you can purchase items that have been previously used by someone else. And recycling of materials after the end of their original purpose allows for at least some extension of their value. But there is another “r,” which in some ways can be seen as a specialized form of reuse, that is becoming more popular–repair. If you own something with minor damage or performance issues, you can choose to repair it rather than replace it. According to WRAP, a UK organization dedicated to resource efficiency and the circular economy, “Worth over £200m in gross revenue each year, 23% of the 348,000 tonnes of waste electrical and electronic equipment (WEEE) collected at household waste and recycling centres could be re-used with minor repairs.” The US company iFixit reports similar statistics, and further states that for every 1000 tons of electronics, landfilling creates less than one job, recycling creates 15 jobs, and repair creates 200 jobs. There are many barriers to repair, including costs (real or perceived), knowledge, confidence in those performing the repair (one’s self or someone else), and access to tools, instruction manuals and repair code meanings which tell technicians exactly what the problem is so they can address it. Manufacturers of a variety of products, particular those with electronic components (everything from automobiles to cell phones to tractors) have come under pressure in recent years over the attempt to monopolize access to parts, tools, and necessary information for performing repairs, leading to what is called the Right to Repair movement. Currently, 18 US states, including Illinois, Minnesota, and New York in the Great Lakes region, have introduced “fair repair” bills which would require manufacturers of various products to make those tools, parts, and pieces of information accessible to consumer and third-party repair shops. You can read more about the history of the right to repair movement and right to repair legislation on the Repair Association web site. Illini Gadget Garage. This one’s my favorite, but I’m admittedly biased, since I helped launch this project and coordinated it for the past few years. The IGG is a collaborative repair center for personally-owned electronic devices and small appliances. “Collaborative repair” means that project staff and volunteers don’t repair your device for you; rather they work with you to troubleshoot and repair your device. Assistance is free; consumers are responsible for purchasing their own parts if needed, though staff can help determine what parts might be necessary. In addition to working with consumers by appointment at their campus workshop, the IGG crew conduct “pop-up” repair clinics in various public spaces around the Champaign-Urbana community and across campus. Consumers not only benefit from the “do-it-together” approach, they also get access to specialized tools (e.g. soldering irons, pentalobe screwdrivers, heat guns, etc.) that enable device repair, which many folks wouldn’t have in their tool box at home. Though successful repair obviously can’t be guaranteed, project staff say that if it has a plug or electrical component, and you can carry into the shop (or pop-up), they’ll help you try to figure out and fix the problem. The Bike Project of Urbana-Champaign. Including both a downtown Urbana shop and a Campus Bike Center, this project provides tools and space for bicyclists to share knowledge and repair bicycles. This project sells refurbished bikes, and individuals who are willing to work on fixing up a donated bike (with assistance) can eventually purchase a bike at a discount. See https://thebikeproject.org/get-involved/join-the-bike-project/ for membership fees; an equity membership based on volunteer hours is available. CU Community Fab Lab. 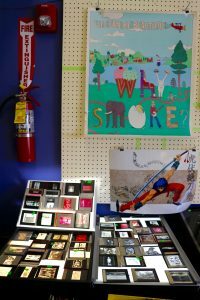 Though technically a makerspace, this project provides access to a variety of tools that individuals may not own themselves, as well as a community of tinkerers and creative minds to foster sharing of knowledge. See http://cucfablab.org/inside-the-lab/tools/ for available tools. Note that some fees may apply for consumable materials. Workshops are also offered to help you learn various skills. The Fab Lab is free to anyone in the community during open hours. Makerspace Urbana. Another local makerspace, which like the Fab Lab, provides access to tools and expertise of fellow space users. Anyone can use the space for free during open hours; members who pay a fee can obtain a key for 24/7 access. See their list of available tools. They also offer a computer help desk for personal computer diagnostic and repair assistance. CU Woodshop Supply Inc. With a team made up of former contractors, experts woodworkers, and industry trainers, this project can help you with woodworking projects and questions. They have a consignment project to distribute used machinery, host an annual Used Tool Sale and Swap, and offer classes to help you learn woodworking skills that might assist with repairs as well as creative projects. Wherever you live, you can watch for repair-related courses from local community colleges and park districts, and check to see if your local library operates a tool library, or at least lends some tools (e.g. 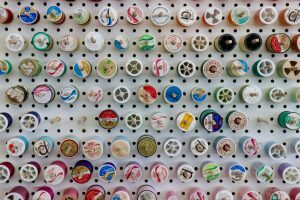 you can check out a sewing machine and accessories from the Urbana Free Library). Many libraries also provide access to online research tools that can assist with auto and home repairs or more (e.g. see https://champaign.org/library-resources/research-learning). Repair Cafés. You can also readan IGG blog post about this global phenomenon, and see the slides from a NYS DEC webinar on these types of projects in that state. Fixit Clinic. A particularly successful example exists in Hennepin County in Minnesota. Restart Project. Focused on electronics, this is a UK project, but you can host a “restart party” anywhere, and some K-12 schools, including some in the US are integrating restart centers to help teach repair skills and instill ideas of sustainability among students. Learn more about the circular economy on the WRAP web site, or the Ellen MacArthur Foundation web site. Both the weather and the planet are heating up. We can’t do much about the current temperature, but there are things we can do to cool down the planet. Summer is the perfect time to develop new habits. Below is a list of sustainability tips and ideas to help you on your sustainable journey this summer that will hopefully last long after. Reducing your meat consumption is one of the best ways to live a more sustainable life. Meat’s carbon footprint is much higher than that of plant-based foods. Summer is fresh fruit and vegetable season, so it’s a great time to start making them a feature on your plate. Consider making Meatless Mondays a habit. Supporting local farmers markets is good for the local economy and for the environment. Local food travels a shorter distance between the farm and your plate than food sold in the average grocery store. Buying from local producers also helps the local economy by keeping your dollars in the community. Both Champaign and Urbana hold farmers markets every week during the summer. The Sustainable Student Farm also holds a farm stand on the quad every Thursday which is a great option if you live on campus and don’t want to travel far. Staying hydrated in the summer is important, but it doesn’t have to be at the expense of the planet. Each day, people in the U.S. throw away more than 60 million plastic water bottles, most of which end up in landfills or as litter in America’s streets, parks, and waterways. Vacations are a huge part of summer for most people. The Minnesota Pollution Control Agency offers some great tips for greening your travel. Although spring is traditionally when people deep clean, summer is also a great time to sort through your house and decide which things you no longer need. You can take old or broken electronics to the Illini Gadget Garage, which is an organization that works to keep electronic waste from entering landfills by offering guided repair sessions. For items you no longer want, get together with some of your neighbors and have a yard sale. Also, consider donating or recycling what you don’t need. 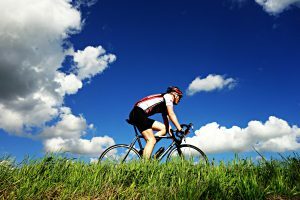 As the weather warms, switching out your car for a bike or a walk is a great way to significantly reduce your carbon footprint and get some exercise at the same time. If you’re looking to get more directly involved in sustainability efforts but don’t know where to begin, try volunteering at different places to see what you are most interested in. There are a variety of volunteer opportunities in Champaign and Urbana. You can volunteer to help out at either of the local farmer’s markets, or if you’re interested in the process of growing food, you can volunteer at local farms like Sola Gratia, Prosperity Gardens, or the Student Sustainable Farm. 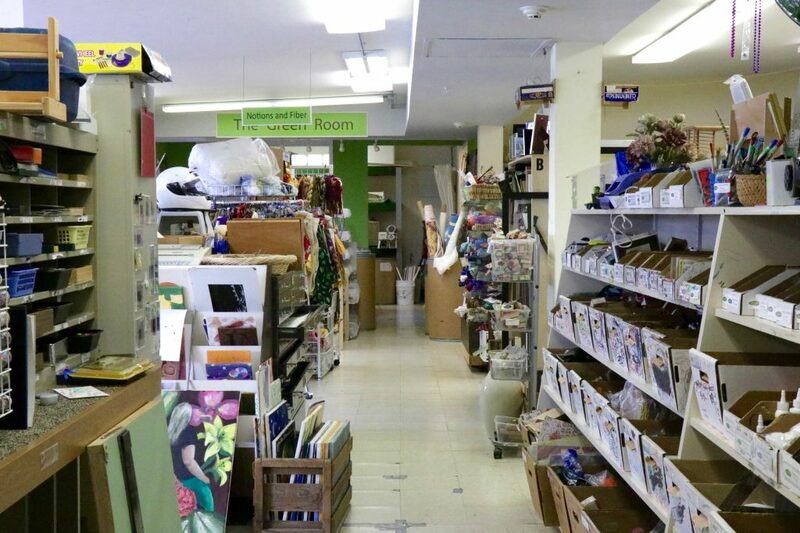 There are also opportunities to volunteer at thrift stores like Courage Connections that sell recycled clothing and work to reduce the amount of textile waste that ends up in landfills every year. For more information on living a greener life, visit the Green Living LibGuide. Looking for information on other sustainability topics? 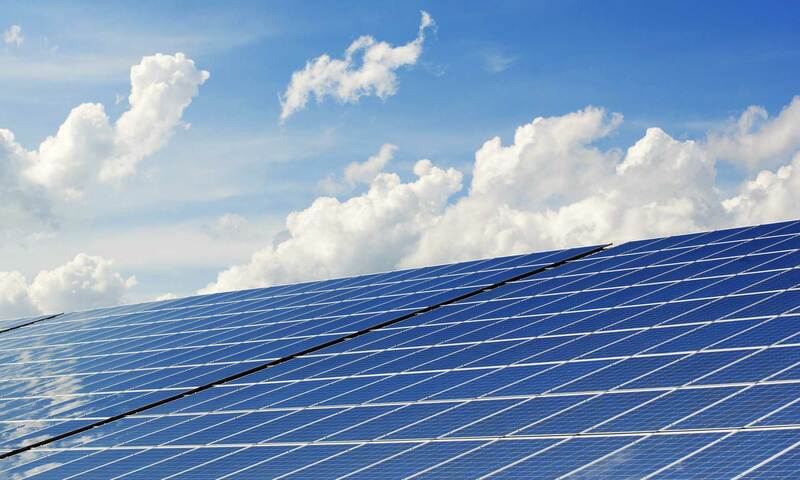 See ISTC’s full list of guides to sustainability by topic. Today is an important “holiday” of sorts for those of us who are sustainability professionals. On this day in 1972, the United Nations Conference on the Human Environment, held in Stockholm Sweden, began (June 5-16, 1972). The purpose of that conference was to discuss human interactions with the environment, as well as encouraging governments and international organizations to take action related to environmental issues and providing guidelines for such action. This was the UN’s first major conference on international environmental issues, and it culminated in what’s commonly called the “Stockholm Declaration”—the first document in international environmental law to recognize the right to a healthy environment. Two years later, in 1974, the first World Environment Day was held on June 5 with the theme of “Only One Earth.” Since then, World Environment Day has been celebrated annually on June 5th. 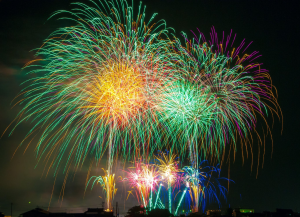 Each year has a theme around which activities center, and beginning in the late 1980s, the main celebrations began to rotate to different cities around the globe. Learn more about the UN Conference on the Human Environment at https://sustainabledevelopment.un.org/milestones/humanenvironment and the history of World Environment Day at http://worldenvironmentday.global/en/about/world-environment-day-driving-five-decades-environmental-action. Share your selfie on social media and “tag” three friends, businesses or high-profile people to challenge them to do the same within 24 hours. Be sure to use the #BeatPlasticPollution hashtag and mention @UNEnvironment. So what single use plastic item will you pledge to give up today—plastic straws, disposable plastic shopping bags, disposable coffee pods, plastic water bottles, or something else? 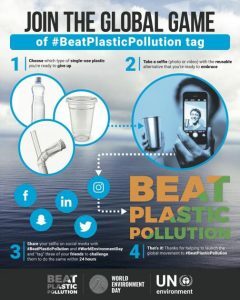 For inspiration, see http://worldenvironmentday.global/en/get-involved/join-global-game-beatplasticpollution-tag. This post was written by Joy Scrogum, ISTC Sustainability Specialist, for the Great Lakes Regional Pollution Prevention Roundtable (GLRPPR) Blog. Did you know that there are more living things in a teaspoon of soil than there are people on earth? Soil holds an abundance of nutrients and is necessary for life on earth. Unfortunately, soil health isn’t something people often consider. Research shows that one-third of the earth’s soil is already moderately to highly degraded due to various issues such as erosion, nutrient depletion, acidification, urbanization, and chemical pollution. Soil health is essential for growing food. We can’t have a sustainable future if we don’t maintain it properly. Composting is one of the best ways to naturally fertilize and replenish our soil. Compost is composed of decomposed organic material that can be added to soil to nourish and encourage its natural regenerative cycle. Composting turns trash into treasure. In addition to fertilizing the soil, composting enriches the soil and helps it retain moisture, reduces methane emissions, increases carbon sequestration, encourages production of nutrient-rich materials, and reduces the need for harmful chemical fertilizers. Furthermore, compost is an excellent way to reduce food waste because all fruit and vegetable scraps are compostable. This is beneficial because every year sixty million tons of mineral-rich food waste goes into landfills. Compost also increases the ability of soil to sequester carbon, especially when combined with biochar. When paired with nitrogen, carbon improves soil health. Creating and applying compost is pretty easy. You don’t need fancy equipment or lots of land. Composting can even be done indoors in small spaces by vermicomposting, which uses worms to expedite the decomposition process. 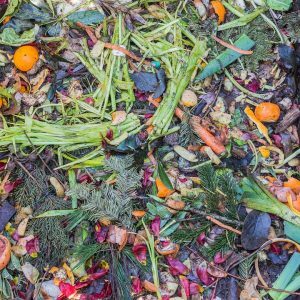 Compost requires three basic ingredients: browns, greens, water, and air. Browns include things like dead leaves, branches, and twigs. They supply carbon. Greens include grass clippings, vegetable waste, fruit scraps, and coffee grounds. They supply nitrogen. The water provides moisture to help break down the organic matter. Cornell University recommends a 30:1 ratio of carbon (browns) to nitrogen (greens). Turning is the final component, though it is not a necessary one. Turning involves moving the material on the inside of the compost to the outside. Nitrogen builds up in the center of your compost so turning the compost is necessary if you want to expedite the decomposition process. If you turn your compost more it will take a shorter amount of time to create the nutrient-rich soil. Across the state, there are many efforts to encourage community-wide composting. Locally, the Champaign County Landscape Recycling Center recycles yard waste into two types of compost. Champaign County has been hesitant to implement a county-wide composting program that would include food waste after pushback from community members who were concerned about potential odors. Contrary to popular belief, compost is not waste and it does not emit odors, as long as it is properly maintained. The University of Illinois Extension has provided a great overview of how and why to compost if you are interested in creating an individual compost system. The Illinois Food Scrap Coalition is developing a scope of work related to advancing food scrap composting in Illinois. A score of municipalities in the Chicago area provides curbside organics recycling. In addition, there are dozens of composting facilities around the state. Finally, SIU Carbondale is recycling tons of dining hall food waste into compost at the on-campus Forced Air Composting Facility, where student workers also learn about the composting process. Universities in other parts of the country are also generating compost. Yale University collects paper towels, and Cornell University provides composting education materials and programs through the Cornell Waste Management Institute. At the University of Massachusetts Lowell, they’re not only composting all food waste generated on campus, they’re also selling that compost to the community. By continuing to boast about compost, we can work to keep our soil healthy and continue the natural regenerative cycle. The Commission for Environmental Cooperation (CEC), an intergovernmental organization supporting cooperation among NAFTA partners to address environmental issues of continental concern, has published a new white paper focused on food waste in North America. 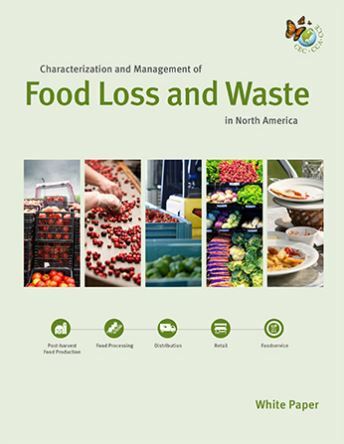 Characterization and Management of Food Loss and Waste in North America provides statistics about the amount of food lost or wasted collectively, and by country, examines root causes and the environmental and economic impacts. It also summarizes current approaches and opportunities to reduce food loss and waste in the US, Canada, and Mexico. This white paper presents an overview of the accompanying foundational report, and serves as a key resource for policy makers at all levels of government, as well as members of the food industry. Among the many listed environmental and economic impacts, is the fact that market value of the food loss and waste in North America per year is US $278 billion. The CEC has also produced an infographic which summarizes the various key findings and suggested approaches to reduce food loss and waste. See http://www.cec.org/sites/default/fwinteractive/index-en.html. SDG 12: Ensure sustainable consumption and production patterns. Specifically, Target 12.3, “By 2030, halve per capita global food waste at the retail and consumer levels and reduce food losses along production and supply chains, including post-harvest losses.” In alignment with SDG Target 12.3, in 2015 the US EPA and USDA jointly announced the nation’s first domestic goal to reduce food loss and waste by half by the year 2030. SDG2: End hunger, achieve food security and improved nutrition and promote sustainable agriculture. The key findings of the CEC white paper, for example, include the amount of food loss and waste for North America per year is equivalent to 217 trillion kilocalories in potential energy. Feeding America reports that 41 million people in the US struggle with hunger, and food insecurity exists in every county in America. SDG 13: Take urgent action to combat climate change and its impacts. Not only does discarded food contribute to greenhouse gas emissions, but consider the energy use and emissions associated with the production of food that goes uneaten. Reducing inefficiencies throughout the food production and consumption system can help avoid emissions that our warming world cannot afford (for one discussion of this, see the April 7, 2016 issue of the Guardian). What can you as an individual do? First, become familiar with the sources of food loss and waste and suggested approaches, as outlined in the CEC white paper and other resources highlighted on this blog in the “food waste” category. Let your legislators, and favorite retailers, restaurants, food service operations, and manufacturers of food products know that you appreciate any positive efforts they take to address food waste, and that you expect improvement aligned with strategies identified by CEC and other organizations focused on this issue. 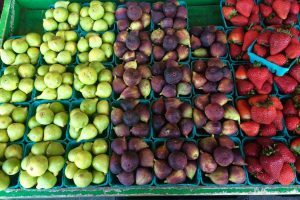 Check out the US EPA suggestions for reducing food waste at home, and further their Call to Action by Stakeholders. Also, check out the Save the Food web site produced by the Natural Resources Defense Council and the Ad Council. The Love Food Hate Waste web site produced by UK organization WRAP also provides a wealth of tips and even recipes to help ensure food fills stomachs and not landfills. And finally, as you learn more about food waste issues and strategies for reduction, share what you learn and the stories of the actions you’re taking with others. A problem of this complexity and magnitude requires everyone to contribute to the solution. Your sharing knowledge and inspiration is crucial.